Are you a tester Labrador, or a Chihuahua? I often think of software testers as being either Labradors or Chihuahuas. Labradors are friendly creatures. All they want is for the pack to be together and everyone to be happy. Labs just want to help everyone out, even if as a human I don’t always find a drooling dog snout on my keyboard helpful. That wagging tail is just a display of love and joy, even if it happens to send your best china crashing to the floor. There’s a reason why people use Labs for service dogs. What strikes me as the most typical Lab characteristic, though, is their curiosity. Labs view all things new as potential toys. And if you can’t play with it, you might be able to eat it. Sometimes you’re lucky and can do both. Labs happily embrace new things with their tails wagging full blast. Chihuahuas are slightly different. In general they tend to be anxious little bundles of nerves. A Chihuahua faced with something new often reverts to incessant yapping while running around in circles, or hiding behind a larger object (which is basically anything apart from another Chihuahua). Chihuahuas also seem to be more territorial. They will ferociously guard what they consider theirs and might even go for the throat. Which in reality means they might reach your calf. I can’t help but sometimes wondering what the purpose of Chihuahuas is, apart from, well…being lap dogs. Chihuahuas also seem to need more accessories than Labs. There are unlimited fashion items such as sweaters, jackets, boots etc available. Labradors just need the world to explore. In dire cold and meter deep snow you may give a Lab a blanket to sit on outside. 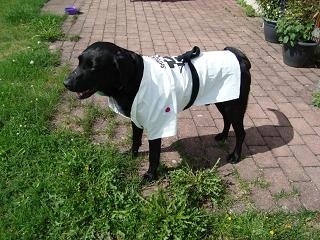 You do not dress Labs up just for the sake of dressing them up. Travelling with a Lab means packing food, a leash and if you’re feeling extravagant maybe a tennis ball. My apologies to all Chihuahua fans out there.